The frontman and the founder of the group is Demon (Sergey Denisov). His first project back in 1997 was “Black Widow” group. The style of the music as it was defined by Moscow magazine “Rock City” in its review of the first demo was melodic, classic death metal. As the group gained popularity new ideas appeared, which required actualization. Soon the group members no longer suited Demon as far as music was concerned, and it was decided out of court to disband the group. Here, properly speaking, the history of “Lexx” begins. The name was taken from the title serial, new instrumentation was gathered. In a few months the best material was rehearsed and polished. As a style base one of the most technical and aggressive variants of death metal was chosen. If we consider foreign groups with the same manner of playing (though it won’t be exactly the same), these are first of all Vader, Master(USA) and Morbid Angel. “Lexx” made its debut together with “Aria” in Ekaterinburg on March 23, 1999. Let us not argue the differences of average heavy metal a la Iron Maiden and brutal, technical death metal performed by “Lexx”. During the concert the audience reacted very vividly and, according to the praises after the concert, “Lexx” was more to their liking then the notorious “Aria”. The group gave a series of concerts in native Ekaterinburg, performed as a guest at an annual festival “Ural Rock”, and received fulsome praises from both the jury and the audience. A journey to Maloyaroslavetz, which is near Moscow, where international bike-show is held, is of interest. After the performance “Lexx” was given a “star” status. The demands to sell discs were declined, as far as there were no records at that time. Since December 1999 critical hardships began. By that time material for the first album was ready, its working name “Anger”, later it was released under name “Storm in Your Brains”. The topic questions of the songs mostly concern eternal human values: life, death, simple human relations. They failed to record it due to falling-off of the group. For three months the group performed with 2 men and the audience accepted such shifts of the collective rather gently. In December 2000 a new drummer was found, rehearsals began. In February 2001 bass joined, which required considerable improvements. This set of men went to death-panorama in Perm, took part in two festivals in Ekaterinburg that very spring. In 2002 discord in the collective began, the group fell-off. In April 2002 Demon goes to studio and in half a year records three albums with new musicians: “Storm in Your Brains”, “Life and Death”, “Body”, rehearsals began. Before having the copyright registered in the USA, the name had to be changed, as the list contained a lot of Lexxes and they disliked the idea of being one more. The name “Ambrazura” was cooked-up in 10 seconds, its an untranslatable abbreviation. Circularization to magazines for reviews began and sales in the USA commenced. 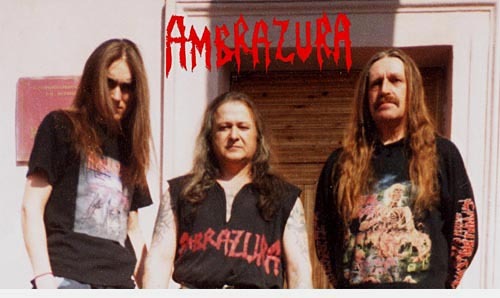 In August 2003 an hour and a half appearance of “Ambrazura” took place, which shocked all its fans and not only them. A great number of super-reviews (the USA, Germany, Russia) for the first album “Storm in Your Brains”, which was released in November 2003 at Stygian Crypt Production.